Located in the heart of Washington, D.C.’s Penn Quarter, the Dirty Habit restaurant at the iconic Kimpton Hotel Monaco DC offers an invaluable addition to the city’s thriving restaurant and bar scene. Hotel Monaco DC is located inside the classical revival architecture of the General Post Office building, which was constructed in 1839 and has since been named a National Historic Landmark. Following the closing of the restaurant that had previously inhabited the Hotel for 14 years, Dirty Habit was interested in taking its place and opening a restaurant on the East Coast. This would be the second restaurant installment, since the first Dirty Habit location is in San Francisco, and the restaurant wanted to ensure its East Coast location would attract a multitude of diners and be as successful as its flagship restaurant. The designer, Stanton Architecture, is known for overseeing the recent renovation of the historic mail sorting room. They specialize in compelling design solutions for hospitality, historic preservation, master planning and rebranding services. Teamed with interior designers Dawson Design Associates, the two firms were confronted with the challenge of creating a dynamic space that featured cutting-edge design while adhering to the U.S. General Services Administration’s (GSA) historic preservation committee requirements to preserve visibility to the General Post Office façade. The architects also knew the space had suffered from heat gain and glare in the past and the courtyard could get notoriously hot and uncomfortable in summer months. Based on this information, when designing the space the architects needed to consider how they could create a space with structural glass to preserve views to the historic façade of the post office while developing a cutting-edge design. Additionally, the architects wanted to ensure they would be able to combat heat gain and glare since they would be replacing the previous restaurant’s traditional façade with an all-glass façade. The architects also wanted to provide diners with a truly dynamic experience so they felt equally comfortable eating indoors or relaxing in the outdoor patio space. The architects knew they would be unable to use traditional options, such as blinds and shades, since these solutions would block views and interfere with the design of the space. After exploring a number of solar control options, the architects dared to be dynamic by choosing SageGlass dynamic glass for its ability to optimize daylight, outdoor views and comfort while preventing glare, fading and overheating. SageGlass’ innovative technology answered all of the architects’ design challenges by preserving the view to the post office façade, optimizing dining comfort, mitigating solar heat and glare and creating a unique dining experience. 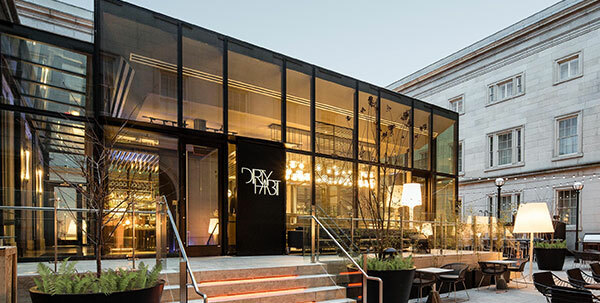 SageGlass partnered with glazing contractor Innovo Construction, LLC, to install 2,042 square feet of dynamic glass on the façade and skylight of the restaurant to provide diners with unobstructed views of historic landmarks as well as a dining experience free from heat gain and glare. Diners are able to enjoy the outdoor patio space or can dine inside and still experience the ambience of the outdoors. Additionally, the dynamic glass façade stands out among the classical architecture of the General Post Office, attracting DC tourists and locals to visit the restaurant. The restaurant, which officially opened in September of 2016, features cocktails and social plates, edgy design and an urban patio that encompasses an entire city block. Located across the street from the Smithsonian American Art Museum and the Smithsonian National Portrait Gallery, the restaurant attracts visitors from around the world who come to the nation’s capital.